For some reason, when I visit a different region of the U.S., or am in another country, it seems odd to me to see restaurants from cultures or ethnicities than the one I am experiencing. For example, when I was in Japan, I found it quite interesting to have pizza at an Italian restaurant and even more curious to partake of French cuisine. I don't know why it feels odd, because it sure doesn't feel weird to me in the midwest when I have lunch at my favorite Persian restaurant or pick up Sushi on the way home from work from my local grocery store. Still, when I'm out of my home element, I expect local flavor, I guess. Like now. I'm in the southwest. I expect to see Mexican restaurants on every corner! And of course, they are there. On Monday, I visited two of them (excellent, too, by the way). But I'm always surprised when I find wonderful food of a different "flavor" in a regional area. Take, for example, Farmington, New Mexico. I've been coming to Farmington for years for work. I've sampled a fare number of restaurants in the area. My favorite story to tell about Farmington is that it is the one place in the world I would not expect to get the best sushi I've ever eaten. It's true! And you shall find more out about that as the week rolls on. I will be visiting that particular restaurant this week and of course, reporting on my visit. It would be worth a repeat performance. We ordered a couple of appetizers. 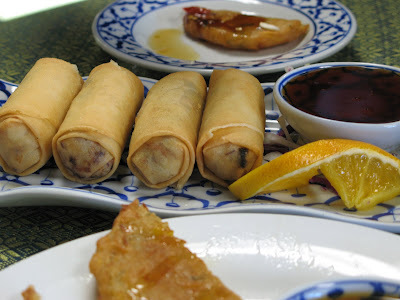 The Veggie Cakes caught my eye and the egg rolls that of my vegetarian friend. Take a look. The Veggie Cakes were my favorite. 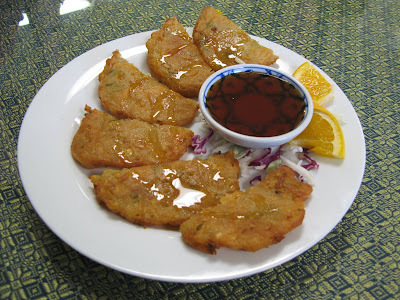 They were a mixture of sweet potato, corn and green onions, browned and topped with honey and with their signature sweet and sour sauce. Wow. Crispy and flavorful. The drizzle of honey, combined with the sweet and sour, gave it a unique taste, bordering on earthy and flowery at the same time. The sauce was heavier on the sweet than the sour and also, I believe, was made with honey. 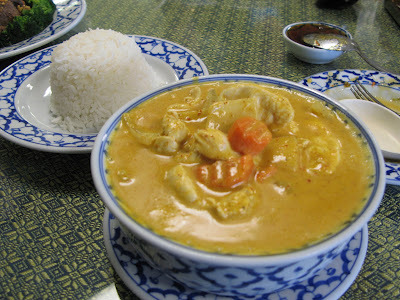 For my entre I chose the Yellow Curry Chicken, mild (which was still hot enough for me) with sweet coconut milk and chockful of meat and veggies. Very, very good. Couldn't eat it all, of course, so came home with a doggie bag. My friends order Beef Broccoli and Yellow Curry Tofu. All were pleased and we left sated, vowing to come back again the next time. You fascinate me. Your pictures of food are inspiring. Do you and and the other sister writers have somewhere posted when and where you do book signings? Hi Jennifer. Inspiring? Obsessed maybe? LOL My friends and coworkers have gotten used to me...so far. Wonder when they will say, "If you take another picture of my food I'm stabbing you with a fork!" I have fun with it though. We only have the one booksigning coming up in Lexington Oct 18. You can find out about it at www.legendtennessee.com. I'll email you, too!